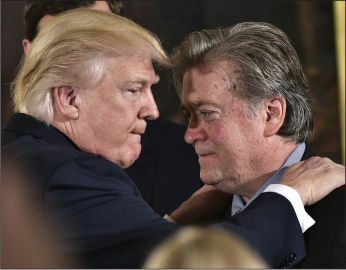 If Green didn’t occasionally signal his distaste for Trumpian politics, “a reader might come away thinking Bannon was the book’s hero,” said Barton Swaim in The Wall Street Journal. Bannon is, after all, an underdog figure—a working-class Catholic and former Navy officer who talks his way into a Wall Street job, scraps his way to a fortune, then turns to toppling a smug elite. By 2012, he is running Breitbart, counseling Trump, and battling even Fox News in his bid to defeat the globalists and put the nation on an “America First” path, said David Catanese in USNews.com. Told in 2015 that Fox News’ Roger Ailes doesn’t approve of his methods, he sends back this: “Go f--- yourself.” Through Breitbart, he is activating an army of angry young men who spend hours a day on social media. By funding research for an anti-Hillary best- seller—and then feeding the dirt to The New York Times—he has damaged the Dems’ front-runner irrevocably.